There’s a lot of pressure on Sudan, one of the last three northern white rhinos in the world, and the last of the males. At 45 years old (elderly in rhino years), Sudan lives at the Ol Pejeta Conservancy in Kenya with two female companions. He’s surrounded by armed guards 24/7, protecting him from potential hunters. Sudan is arguably the most eligible bachelor of the animal kingdom; even Tinder made him a profile back in 2017. But it might all be for naught if he can’t fight off a deadly infection that’s ravaging his back right leg. The fate of the northern white rhino depends on Sudan being able to conceive with the two other female rhinos. If he’s unable, the entire subspecies will end with them. According to Ol Pejeta, Sudan has trouble mounting females in his old age, making it hard to conceive naturally. On top of that, he suffers from low sperm count, so dude really just can’t get a break. 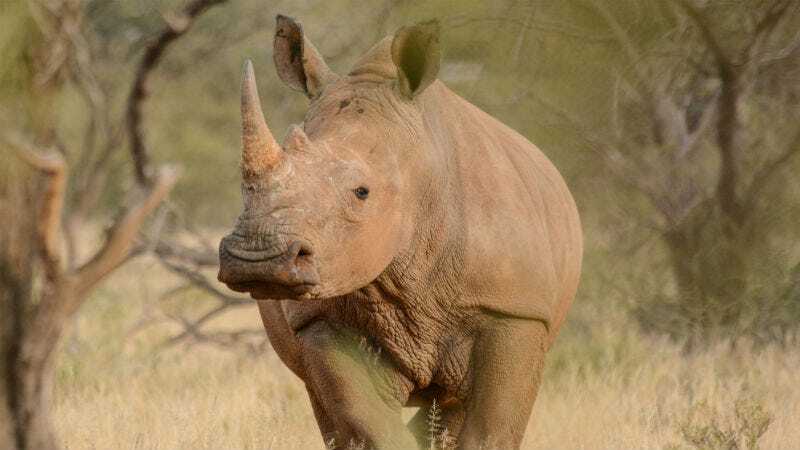 A committee at the conservatory are considering in vitro fertilization, as well as inseminating other rhino subspecies that aren’t the northern white. Sure, the offspring won’t be 100 percent northern white rhino but it’s better than nothing. The rhino population in Africa has declined by over 97 percent since the ‘70s, so in this case, scientists are down with the swirl as long as it prevents extinction.